Could you authorize our FSSP Priest here in Quebec City, Father Pierre-Henri Gouy, to celebrate one (just one!) Mass according to the Forma ordinaria? 2) What do I mean by "Forma ordinaria"? The Vatican 3 Mass! These days, "Forma ordinaria" (also known as "the Vatican II Mass") means different things to different people. To the majority of Priests here in the Province of Quebec, it almost means: "Forget the official liturgical norms (whether before or after Vatican II), and offer your vain Ego to the adulation of your parishioners". chose the option closest to the Forma extraordinaria. do it like it's done in the Forma extraordinaria. 2.1) Everything in Latin. "[...] the use of the Latin language is to be preserved in the Latin rites". [Sacrosanctum concilium, #36]. 2.2) Wall-to-wall Gregorian Chant. "The Church acknowledges Gregorian chant [...] should be given pride of place in liturgical services". [Sacrosanctum concilium, #116]. 2.3) Priest ad orientem during the Eucharistic Prayer (i.e. "his back to the people"). Not mentioned by the official Vatican II documents, but the GIRM (General Instruction Of The Roman Missal) requires the liturgy of the Word to be celebrated versus populum while providing for the continuation of the Church's immemorial practice of celebrating the liturgy of the Eucharist ad orientem. [See numerous GIRM quotes in Celebration of Mass Ad Orientem in a Parish Setting, Rev. Timothy V. Vaverek, S.T.D.]. 2.4) Communion on the tongue. Not mentioned by the official Vatican II documents, but: "each of the faithful always has the right to receive Holy Communion on the tongue". [Redemptionis Sacramentum, #92]. See also all the good reasons to avoid communion in the hands in Section 3 of Let's Commit Sacrileges In Church! I guess the official name for such a Mass would be something like "Strictly interpreted Forma ordinaria", but I find it simpler to just call it "the Vatican 3 Mass" or the "Mass of Pope Elvis 1! 3) Why would the FSSP in Quebec City want to do this? The FSSP exists, among others, to help preserve the Forma extraordinaria of the Roman liturgy. 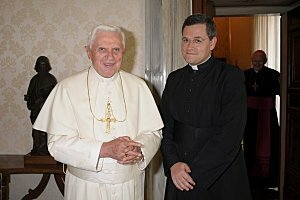 So why would the FSSP want to celebrate one "Vatican II" Mass? Why would the FSSP in Quebec City want to do this apparently weird thing? I claim there is one general reason to do this, and three categories of special reasons. We will examine the special reasons in the next sections: somewhat "selfish" reasons that target the growth of the FSSP in Quebec, more "altruistic" reasons aimed at all Catholics in the Province, and a few very practical reasons. Most Quebec Priests live in a pretty sheltered world. They sleep in a nice room in the Rectory, have their meals made for them, go to many meetings (and the other attendees are usually on the diocesan payroll, so nobody "rocks the boat"), etc. We laypeople live in another world. We live in the trenches, on the front line. We often work with a boss and collegues who are Atheists or anti-Catholic. We are forced to pay large taxes on our small incomes, only to see our money be used by the Government to fund the killing of unborn children, homosexualist propaganda, compulsory State schools that try to rip Faith out of our children's hearts, etc. As if that wasn't enough, we are often "shot in the back" by "Catholic" Priests and Bishops who openly contradict the official teachings of the Church. We laypeople need ammunition. We need strong arguments that will silence the usual anti-Catholic attacks. We need strong arguments to convince people that they should come back into the Catholic Church. Of course, the FSSP cannot solve all our problems, but one single Forma ordinaria Mass (recorded on DVD) could work wonders. "Say The Black, Do The Red", the Movie. Of course, God does not want the FSSP to be some commercial organization, and the Gospel of Christ is not a "product" to be promoted like a soft drink or brand of cigarettes! But the FSSP in Quebec City does needs good publicity, and we should listen to what marketing experts have to say, when we have a marketing problem. 4.1 "Promotional". This is the basic characteristic. If you want somebody to do something, you need to provide them with: (1) the knowledge to do it; and (2) the desire to use that knowledge! So the promotional object has to show the customer how to get to our "product". For example, a web site address, a road map, a picture of our building, etc. The promotional object also has to elicit the desire of the customer to come and see us, usually by making his mouth water by showing him all the advantages of our "product". 4.2 Inexpensive to manufacture. We are going to give these objects away, remember! 4.3 Unusual. If we want to tickle people's curiosity, we have to surprise them a bit. Keeping in mind these characteristics of good promotional materials, consider now that a DVD is about 0.50$ cents, so we could have plenty of them made. We could hand them out to coworkers, family members, etc. Sooner or later, somebody would pop it into his DVD drive, and see a Catholic Mass. The beauty of the Latin and the Gregorian Chant, the reverence of people kneeling to receive our Lord, the apparent strangeness of a whole congregation, including the Priest, all turned toward the Lord, etc., all this might make them want to come to our local FSSP church! And the web site address would tell them where it is! Moreover, this DVD would still be very useful, even for those who didn't watch it. When they asked about the strange title: "Say The Black, Do The Red", we could explain to them that a Roman Missal is printed in two colors, so the Priest can know exactly what to say during Mass (what is printed in black), and what to do (printed in red). Even if this person ended up using this DVD only as a coaster for his glass of beer, the title would remind him that a Liturgy entrusted by God to His Church must be respected, that a Mass is not a show, that the Priest's job is not to "express his creativity". That would be great! But another advantage would be when some viewers reacted negatively. Suppose they started complaining about that "old-fashioned Latin Mass" promoted by those "practically schismatic Vatican II haters". Imagine the hours of fun we would get telling them it is a totally legitimate Vatican II Mass! One of the unfortunate tendencies of religious organizations, in times of decadence, is that they stop thinking about the Common Good of the whole Church, and concentrate on reproducing themselves. In other words, they stop feeling compassion for the problems of other Catholics, content to think (and even sometimes to say out loud): "Well, if they want to solve their problems, they can just join our little clique!" Yes, the mission of the FSSP is not to promote the "Vatican II" Mass, but the reality in the Province of Quebec is that most Catholics have never seen a real "Vatican II" Mass, a "Vatican II" Mass that respects all the official liturgical norms of Vatican II. On the contrary, they are constantly bombarded with liturgical abuses at the limit of what can be endured. Some facts are unescapable. Most French-Canadians are spiritually starving to death. Most French-Canadian Priests will not celebrate the Forma extraordinaria, at least in the near future. As Catholics, we cannot react to this situation by saying: "Am I my brother's keeper?" We cannot react by expecting everybody to become a member of the FSSP. Personally, I prefer chocolate ice cream. But if I could save lives by eating one vanilla ice cream cone, I would do it! For the love of God and our neighbor, we should be willing to eat a "Vanilla ice cream Mass" for one bloody hour! For the salvation of souls, we should be able to say one little Forma ordinaria, just once! The last category of reasons is the least important, but still worth mentioning. 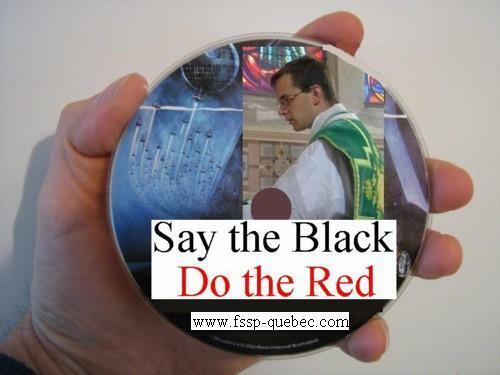 Basically, the FSSP in Quebec City might be the only Parish that could make such a DVD! First, there are only two Gregorian Chant choirs left in Quebec City, the FSSP's and one at Très-Saint-Sacrement. Except the Très-Saint-Sacrement Choir is being kicked out by its own Liturgical Committee who claims Gregorian Chant doesn't have a place in its church! Second, as far as I know, only one person in Quebec City has a current official Vatican II Missal (the third edition, approved in 2001 by Pope John Paul II, still not yet available in an official English translation: Missale Romanum, Editio iuxta typicam tertiam), and of course he's a FSSP parishioner! Third, the very concept of respecting liturgical norms has pretty well been erased from the minds of most French-Canadian Priests, so the local FSSP Priest is probably one of the rare Priests who could integrally "Say The Black, Do The Red". Fourth, if an ordinary local Priest tried something like this, he might get into trouble with the Quebec Conference of Catholic Bishops, but the FSSP has more leeway for the use of Latin, communion on the tongue, etc. See Correspondence with Father John Berg.